Seiza. 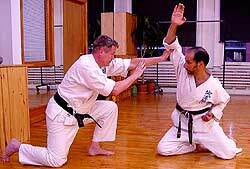 It is the basic kneeling position used at the beginning and the end of martial arts classes and is associated with bowing in respect for teachers and other students. In this posture the knees are bent 180 degrees with the calves tucked under the thighs so you sit on your heels, toes pointed. Few today, however, give it more than a momentary thought, other than the pain so often felt in the ankles and legs, or the growing discomfort felt when sitting this way for long. And when westerners sit this way for very long often their legs go to sleep. So why do we sit this way and what is its value? After all, in the west most people sit in chairs or lounge across their sofas. There is no history or lifelong adherence to a method of kneeling on the floor. Is seiza anything more than a quaint Asian cultural artifact? 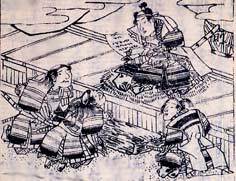 In Japan this method of sitting has always been associated with proper etiquette. In modern karate-do, aikido, kung fu and in many other arts, the role of proper etiquette is a vehicle to show respect, develop discipline and train the mind and body. By being respectful you show appreciation for your art, your study, the teacher and other students. It becomes a triumph of spirit over ego, an acknowledgment of the importance of others and the group over the self. In this form etiquette represents willful discipline of the mind and development of spirit. Seiza and proper etiquette, however, did not always serve this same purpose. Many elements of etiquette that developed during feudal periods of armed warfare (roughly the 12th through the 17th centuries) -- such as where to hold your hands, how to bow, walk, move, or sit, where to sit and the distance expected from others -- all at their core were intimately linked to the practice of sword and other weapon arts, as well as to strategies of self-defense and the ability to react instantaneously. Warriors were almost always armed and even when they slept a weapon was always close by. At any time warriors had to be ready for immediate reaction and mobility -- when outside, in town, when visiting others, in the presence of their superiors or lord, when eating and drinking with friends, when escorting others or on campaign or in battle. Necessity dictated constant awareness of everything around them, the position of others, their environment and always their ability to react or defend themselves. Some samurai took this to the extreme. One story says that legendary Miyamoto Musashi (1600 era), the Japanese masterless samurai famed for his many successful challenges of others, was so fearful of being exposed (without his sword) that he refused to ever take a traditional bath. In this warrior context, if seiza was incorrectly executed, or the kneeling person was lax in his positioning, it could have fateful consequences. Inside a dwelling a razor sharp short sword (often a short knife was also present) was often positioned at their left side just inches from their hand. When outdoors, a longer sword was added, also positioned at their left side (through a sash) or slung across their back. Warriors were taught how to draw a weapon instantly, from seiza and other positions, to strike or parry an attack. Today, this art of sword drawing is most often practiced as a specialty known as iaido (the art of drawing the sword). When formally sitting in seiza, the ability to rise up from a kneeling position instantaneously with the right leg forward simplified the sword drawing, positioned the practitioner for further movement and closed the distance to his antagonist. This was all done with such speed that the rise from seiza, cut and sword's re-sheathing could be done by the most accomplished in a blink of an eye. What made all this possible was proper seiza technique. Likewise, from sieza position many warriors learned empty hand defenses against a sword strike or other attack. A defender could pivot to the side instantaneously to avoid and control a weapon thrust (careful that the knees were not too widely spaced to maintain balance while pivoting) or move forward into a downward weapons strike in order to intercept the striking arm before the attack was fully generated or control a weapon strike coming downward at an angle from the side. Today many empty hand self-defenses are still practiced in diato ryu, aikido, many forms of jujutsu as well in some other arts. But these skills no longer receive the same emphasis in many modern "do" arts, such as karate-do, judo and others. As a result some of the subtleties of proper kneeling and moving have been lost. In other cases just the outer form of etiquette has been maintained, while the original intent, rationale and meaning have been lost to the new ends of "do" oriented arts. This evolution in itself should not necessarily be considered unfortunate, or those who practice the new seiza etiquette should not be considered as "doing it wrong." Westerners aren't used to sitting in seiza, and the art there practice has a different emphasis. The principles of traditional seiza are simple. Upon sitting, the left leg is bent and moved behind, the toes of the left foot maintaining contact with the floor as the shin in lowered, the right leg being forward and bent. As your buttocks sink the right leg is likewise pulled back -- both feet now being supported by the toes. Only then are the toes allowed to move backward so the instep lies flat, the feet pointed in an a angle (they can be kept apart or the big toe of each foot can touch). The hands are then positioned across the thighs. The toe position is critical. If the leg and instep are placed flat with the toes pointed, mobility and balance are lost if you try to move forward to one leg, or otherwise move. For a warrior, such a technique would be dangerous since stability would be sacrificed, and a foe observing such behavior would be alerted to an interval of advantage. Thus as the right leg moves forward, the toes of the opposite foot support a quick, balanced, powerful forward motion -- the movement of the body forward, supported with the right leg providing momentum and mobility behind any sword cut, parry, empty hand defense or transition to standing (in empty hand self-defense situations, however, sometimes the left leg comes up first). Try this experiment. Sit in seiza with your toes pointed. Try to move quickly and powerfully forward or quickly rise. Now try the same with the toes turned to the floor. You should feel a dramatic difference. An alternative exercise is to start to sit, just by collapsing your legs, or by moving one leg back but with the toes pointed. See how you can react to an attack from the front, or a push backwards. Check the stability in this position against that evidenced during traditional kneeling. It is true that in judo, karate-do, taekwondo and many other arts there is no longer an active link to the sword arts or necessity to practice self-defense from seiza. But the practice of traditional seiza does force a heightened state of mental readiness, and awareness, and attention to position and balance. It also maintains a combative link to self-defense scenarios of our warrior heritage and by doing so creates an atmosphere of seriousness around practice that can be easily forgotten -- an integration of attitude with technique. Acknowledgement: FightingArts.com would like to thank Sensei Robin Brown of New York City's Hakuho Kai Daito Ryu Aikijujtsu for demonstrating the proper fundamentals of sitting in Seiza. Christopher Caile has been a student of the martial arts for over 40 years, and a teacher for more than 35 years. He has an MA in International Relations with a specialty in southeast Asia, and has lived and traveled in Japan, Okinawa and south and southeast Asia. He is 6th degree black belt in Seido karate under Kaicho Tadashi Nakamura, a long time student of aikido under Roy Suenaka (Wado-kai aikido), as well as a student of other martial arts (including daito ryu aikijujutsu, judo, boxing and several Chinese arts) and Zen. He is also a teacher of qi gong (Chinese energy medicine), in which he trained under Master Zaiwen Shen and is Vice-President of the DS International Qi Medicine Association. In his business career he has been a newspaper journalist and entrepreneur of several business ventures, and he designed innovative telecommunication and marine products which were developed in companies he founded. In 1999 he founded FightingArts.com (which went live in August 2000) and its parant company eCommunities LLC.